What is the best type of steel for a sword? Not to mention that there are other factors that are actually more important than just the type of steel it is made from (for example, heat treatment and the quality of the forging is more important than the steel itself - a properly heat treated piece of the cheapest plain carbon steel is much better than than the best quality L6 tool steel if the blade is not tempered properly!). BUT LET'S TRY TO KEEP IT AS SIMPLE AS POSSIBLE! So let's ask instead 'what are the different types of steel commonly used to make a sword - and what are their strengths and weaknesses' (when tempered properly of course!). In this article, we will attempt to answer THIS question - and let you make up your own mind on what types of steel best suit YOUR preference (and budget) in a sword. It used to be that just about every sword on the market was made from Stainless Steel. 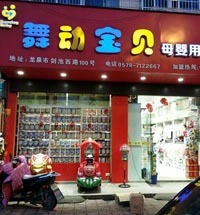 Now, it is almost only relegated to cheap decorative swords - and for good reason! Stainless steel swords (or any blade over 12" long) is considered to be TOO brittle for serious usage and can shatter relatively easily (as demonstrated by the infamous 'home shopping video' below). "A piece of that tip just got me O'Dell..."
To get just a little technical with it - Stainless steel is 'stainless' because it has a high Chromium content (over 11%) - and when a blade gets over 12" long (such as a sword..) the grain boundaries between the chromium and the rest of the steel start to weaken, creating stress points. So the purpose of a sword made from stainless steel is to put it on the wall: and just keep it there to admire from a distance! NOTE: There are a few exceptions to this rule. 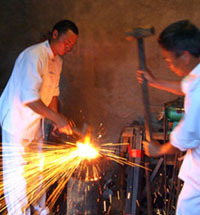 Stainless steel swords can be used for NON CONTACT forms practice. And there have been a few smiths who have been able to use more sophisticated techniques to make it suitable for cutting - but these techniques come at a price, and are never found on the 'surgical grade 440 stainless steel' blades being sold on the Internet and marketed as battle ready because they are sharp... (Yikes!). At the very least, for a functional sword it has to be a (properly tempered) 'High Carbon steel sword'. But what exactly does this mean? 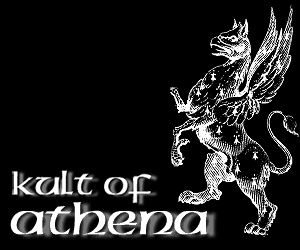 Generally, The American society of automotive engineers (SAE) scale is the one most commonly used by sword manufacturers. And the most commonly used steel for functional swords is plain carbon steel, which is designated by the first two digits 10 - and a number from 01 to 99 afterwards, with each point signifies that .01% of that steel is carbon. For example, steel classified as AISI 1045 has 0.45% carbon content, 1060 is 0.60 carbon, etc. 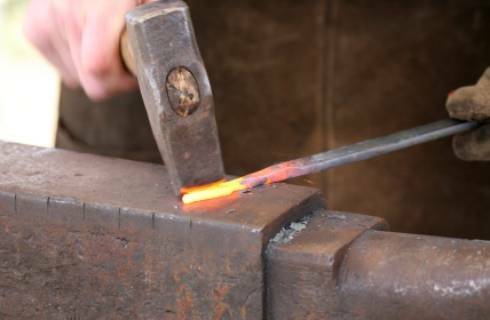 Steels with a carbon content between 0.05 to 0.15 are considered to be LOW CARBON STEEL, and 0.16 to 0.29 MILD STEEL - neither of which are suitable for a functional sword (as any sword with a carbon content of less than 0.40% can't really be hardened and given a decent heat treatment - so is unsuitable for a functional blade, but perfectly fine for fittings). The most popular three types of carbon steel used in swords are 1045, 1060 and 1095, starting with the most inexpensive (1045) with most sword experts agree that the ideal range for a durable and sharp sword is somewhere between 0.5 and 0.7 carbon content. Be especially wary of unknown sword brands or vendors on eBay claiming exotic steels at low prices. More often than not, they are using 1045 carbon steel and hoping that you won't notice the difference. 1045 Carbon Steel swords are quite cheap to make because, being relatively soft, they are easy to make (either by hand forging, pressing or machine milling). Because the minimum carbon content starts at 0.40% - and 1045 carbon steel is 0.45% - it is effectively the MINIMUM acceptable steel for a functional blade. If properly tempered and hardened however, 1045 carbon steel swords can be surprisingly strong, and when you look at a sword under or around US$100, if it just says 'high carbon steel' - it is probably 1045... (and at this price, it is almost certainly machine milled). While by modern standards it is the lowest level of steel quality, the difference in purity of modern steel to medieval or even Japanese Tamahagane is such that a properly tempered 1045 carbon steel sword will outperform historical originals. 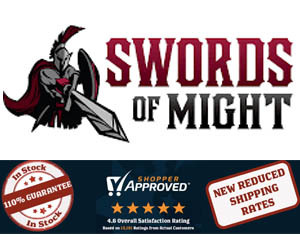 Consequentially, 1060 Carbon Steel swords are very popular, though because the steel is harder than 1045 - are more difficult to forge, shape and polish and thus almost always has a higher price tag. Definitely a great all round steel that is hard enough to take and keep a good edge but focused primarily on it's durability. 1095 Carbon steel is very HARD - and unless it is properly heat treated, this hardness can sometimes be problematic when used on harder targets (either intentionally, or unintentionally - such as accidentally hitting a wooden stand). The main advantage to swords made from 1095 carbon steel is that they can take and keep a much keener edge than swords with a lower carbon content. The disadvantage is that they can sometimes be a little on the brittle side - so durability is traded off for edge retention. 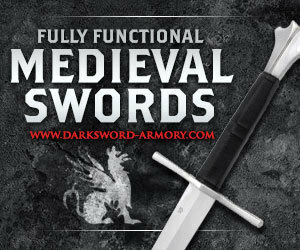 It doesn't mean that a sword made from 1095 carbon steel is exceptionally fragile, but it is simply no where near as TOUGH as the lower carbon content swords. So it just depends on what you are looking for in a blade... Depending on the fittings, how it was made, etc the average price for a good 1060 carbon steel sword starts at about $200 and goes up from there. For our purposes, there are basically two types of spring steel swords - 5160 and 9260. As with the plain carbon steel swords, the last two digits represent the carbon content - so both have .60% carbon and therefore, are like the 1060 carbon steel swords (a great compromise between hardness and durability) - and when properly heat treated, allows objects made of spring steel to return to their original shape despite significant bending or twisting, thus giving 1060 spring steel a special kind of 'twist'. It is a Chinese steel that is known for being cheap, tough - and especially good for items that will be spring tempered (such as - swords). Equivalent to US 1065 carbon steel but with some manganese and other elements, it is used for truck springs in China and the former soviet block countries as well as the bayonets for AK47s. In swords, it is not much different and performs in much the same way as 5160 Spring Steel.. Used by Dragon King and Hanwei primarily for differentially hardened Katana. 5160 Spring Steel is a low Chromium alloy steel, with around 0.7 Chromium - which is not enough to make it stainless (which requires a minimum of 13% Chromium) - but combined with a small amount of silicon (0.2%) results in an extremely tough and durable sword and is favored by sword makers such as Angus Trim, Generation 2 and the blades designed by Michael Tinker Pearce and made by the Hanwei Forge. 5160 Spring Steel was also the steel of choice for the famous Nepalese Khurki - blades so tough and so sharp they are reportedly able to cut off a buffalos head with a single strike! Again, what is critically important is the heat treatment - if it is applied wrong, even the best 5160 Spring Steel sword will take a set (Generation 2 had some issues with this way back in 2007), but when done properly - the end result is spectacular. 5160 Spring Steel Blades are most typically used on medieval style swords and monotempered Katana. It can be differentially hardened, but as it is a deep hardening steel, hamon need to be subtle and simple (suguha, straight line) but holds a hard edge and makes for a good cutter. With a similar carbon content and similar properties to 5160 Spring Steel, 5166 Spring Steel has a manganese alloying agent giving it some additional strength and flexibility beyond 5160, but for all practical intents and purposes, it is only slightly more wear resistant than 5160 (which is, as we know, very durable to begin with). Kind of in the middle between 5160 and 9260 Spring Steel. Made famous by Cheness Cutlery and also used by Australian Custom Sword Maker Brendon Olszowy from Fableblades - 9260 Spring Steel (also called Silicon Manganese Steel) consists of 2% silicon content, giving it an even more dramatic resilience against lateral bends and allowing it to spring back to true even after being bent almost to 90 degrees. Yours truly flex testing a Cheness 9260 Spring Steel Oniyuri Ninjato. A bad cut on a hard target = a broken sword, regardless of the steel..
Tool steel swords have been quite popular in recent years, mostly because swords made from these steels are hard yet quite tough and tend to hold and keep a good edge. While there are several types on the market, there are two that everyone tends to be talking about - and those two are T-10 tool steel and the legendary L6 Bainite. This stuff tends to be very hard (above HRC60 when properly tempered) and the Tungsten means that it is also more resistant to scratches and abrasions than most other types of steels, plus considerably tougher than other swords with a similar level of carbon content. A hard steel, but also very durable. One of my personal favorites. 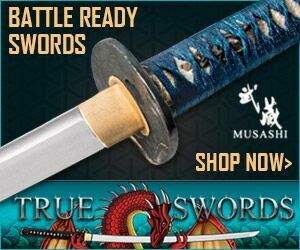 While these swords are generally only seen on higher end production swords, the SBG Custom Katana and Ryujin Custom Katana series swords are made from T10 steel and as seen in the video above, hold their own quite well. L6 Bainite is also a tool steel (band saw steel actually), with the L designating it is a low alloy steel and - when properly heat treated, has a reputation as the TOUGHEST type of sword steel currently on the market - mostly due to the innovative custom sword work of Howard Clark, a smith for the Bugei Trading company who started producing this steel in the late 1990s. 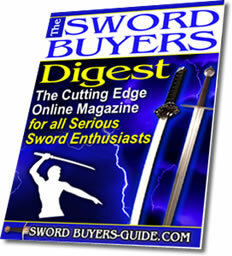 While when properly heat treated (and it is a VERY hard steel to work with) there is little argument that it is one of the toughest steels commercially available for swords, though it can sometimes be prone to rust so needs plenty of maintenance, and of course, is quite expensive to make (no decently made L6 sword has ever had a price tag of under US$1,000 - if you see it under this price point, run screaming - it's probably a con and you are looking at 1045 carbon steel!). As the name suggests, S7 Shock Steel is shock resistant and has many of the characteristics of L6 tool steel when properly heat treated - that is to say it is extremely tough, damage resistant and tough. 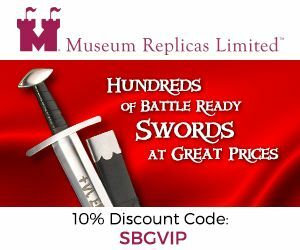 It is also comparatively rare and not commonly found on production swords, making it one of the most desirable sword steels around. Again, it is not magical, nor is it indestructible, but it certainly outperforms most other sword steels. 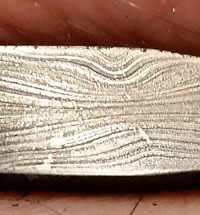 Many people often have questions about Damascus Steel, or folded steel, thinking that it is the best steel for swords - but in reality, what we currently call 'Damascus Steel' is just any of the steel types above that has been folded several times.. However it simply isn't true!! 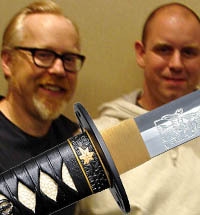 When referring to Japanese swords (as almost all questions about Damascus steel swords are referring to the Katana) - historically this technique was done to try and make Japanese iron ore (which was actually pretty poor quality) homogenous - something which, with the quality of modern steel, is no longer required. In fact, folding when done quickly and without serious attention to detail actually WEAKENS a blade, sometimes fatally! This is especially true on swords sold under the $500 price point, and ALL the cheap ebay blades - most are riddled with air pockets, weak points and inclusions to the point that what could have been a decent sword if it was NOT folded is reduced to something even worse than a stainless steel sword.. Yes, you can get quiet functional ones - but they tend to be in the $800 plus price range. One of the better ones is made by the Imperial Forge and reviewed here - the review is insightful and shows the limits of what a folded steel sword can handle as well as discusses common folded sword steel myths and misnomers..
And even then they are still not quite as durable as a simple unfolded blade made from pure modern steel.. (but they look nicer - and are more traditional, so it just depends on what you like and your intended usage). 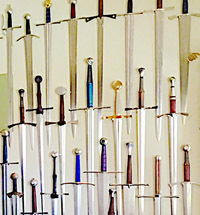 While the sword steels listed above cover the vast majority of steels used for making modern functional swords, there are many others used less frequently. One of the best guides to these lesser known and less common sword steels can be found here at the Cas Iberia website - with short, but to the point listings of over 30 different steel types.